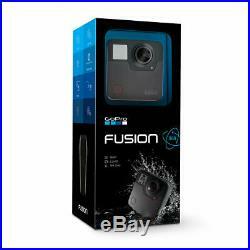 GoPro Fusion 360 Waterproof Digital Camera with Spherical 5.2K Video #CHDHZ-103. Supports 5.2K and 3K Spherical Video 5.2K up to 30 fps, 3K up to 60 fps 18MP Spherical Photos Ruggedized Body, Waterproof to 16' Control via Mobile App Can Use Standard GoPro Mounts Includes Flat and Curved Adhesive Mounts Extendable Grip with Fold-Out Legs. GoPro Fusion Case for Fusion Rechargeable Battery for Fusion Grip for Fusion Adhesive Mounts for Fusion USB Cable. Grant your audiences new perspectives of your adventures with the GoPro Fusion. Using two slightly offset cameras, the Fusion can capture everything that happens around it in 5.2K resolution up to 30 fps. If you're producing content for viewing in VR headsets, 3K resolution at a smooth 60 fps may be more appealing. 18MP photos can also be captured in both raw and JPEG formats for editing flexibility and easy sharing, respectively. The Fusion's capture resolution may be high, but sharing your videos and photos is not a chore. With the GoPro app, you can play back and share your content right after capture. With OverCapture, you can extract a moveable 1080p or 720p chunk out of your existing 360 video and create a standard HD video, as if you had a virtual tripod and zoom lens with a camera operator. To complement the Fusion's spherical video, spherical audio is also recorded. Using multiple microphones to capture 4-channel audio, the Fusion can record sounds from all directions. Playback of the surround sound offers an immersive sonic experience to go with the spherical video. Note: The Fusion requires two microSD cards (one for each camera) to record video. Quick Features Video: Spherical 5.2K video up to 30 fps, 3K up to 60 fps. Photo: Capture 18MP spherical photos OverCapture: Create a video using a 1080p or 720p "punched-out" selection from the spherical capture Digital stabilization 360° audio capture Waterproof to 16' Voice control Built-in GPS. ProTune Like GoPro's HERO cameras, the Fusion also includes ProTune. If you like more control over your image, activate ProTune and gain manual control over ISO and exposure compensation. QuickCapture When you're on the go, sometimes you need to capture footage at a moment's notice. With just a tap of the record button while the camera is off, you can immediately start recording video or taking time-lapse footage. Accessory Compatibility With an attachable two-prong mount, the Fusion is compatible with most standard GoPro three-prong accessories. Flat and curved adhesive mounts are included, as is the Fusion Grip, so you can get shooting right away. Charge the included battery through the USB Type-C port. For faster charging times, use the separately available GoPro Supercharger. Fusion Studio Software Available for free on the GoPro website, Fusion Studio is a Windows and Mac compatible program that allows you to process Fusion footage. Connect your camera, and Fusion Studio will walk you through importing, stitching, and exporting your videos for proper editing in your NLE of choice or uploading to your favorite video hosting sites. GoPro's advanced stitching algorithm will stitch out most mounting accessories for a fully immersive 360° experience. Price protection Policy: Because prices fluctuate, we do not offer price Protection. If you will not be at home to sign for a package, during check out you have the option to send it to your work or a friend or family member. You must include the original packaging and the item must be in NEW condition. Items and packing must not be marred, mishandled, or tampered with by an unauthorized repair person. When upon inspection if these conditions are not met the product will be either sent for repair in the customer's name or immediately sent back to the customer at customer's expense. If the product has cosmetic or physical damage, it will be sent to the manufacture for repair in the customer's name. Camcorders with timers must show less than 30 minutes of use. Items with shutter counters must show less than 30 exposures. Videos tapes, Underwater equipment or products that were submerged in water. When making your return, please include a copy of the invoice and a short note stating the reason for your return. The customer can either return or refuse the package. Typographical Policy: We are not responsible for typographical or pricing errors. Pictures of accessories are for illustration purposes only. We do not sell to resellers: we work hard at getting the best deals for the consumer not the reseller. Those order will be cancelled without any notice. We are not responsible for any consequential or incidental damage resulting from the sale or use of any merchandise bought from us. We are responsible for the monetary value of the merchandise only. Please make sure you have measured and can confirm that your appliance will fit in desired location. It is important to know if your house or apartment is wired with gas or electric connections. Please check before purchasing and select the correct one. When it comes to defective merchandise, once the package is signed for and the recipient has confirmed the product is in perfect condition, Sunset Electronics is no longer responsible for the defective products. The Pixel Hub has grown considerably since then, but we have maintained our focus on the very core of our success... Designed by The Pixel Hub. The item "GoPro Fusion 360 Waterproof Digital Camera with Spherical 5.2K Video #CHDHZ-103" is in sale since Monday, March 4, 2019. This item is in the category "Cameras & Photo\Digital Cameras". The seller is "thepixelhub" and is located in Hillside, New Jersey. This item can be shipped to United States, Canada, United Kingdom, Mexico, Germany, Japan, France, Australia, Denmark, Romania, Slovakia, Bulgaria, Czech republic, Finland, Hungary, Latvia, Lithuania, Malta, Estonia, Greece, Portugal, Cyprus, Slovenia, Sweden, South Korea, Indonesia, Taiwan, Thailand, Belgium, Hong Kong, Ireland, Netherlands, Poland, Spain, Italy, Austria, Bahamas, Israel, New Zealand, Philippines, Singapore, Switzerland, Norway, Saudi arabia, Ukraine, United arab emirates, Qatar, Kuwait, Bahrain, Croatia, Antigua and barbuda, Aruba, Belize, Dominica, Grenada, Saint kitts and nevis, Saint lucia, Montserrat, Turks and caicos islands, Barbados, Bangladesh, Bermuda, Brunei darussalam, Bolivia, Egypt, French guiana, Guernsey, Gibraltar, Guadeloupe, Iceland, Jersey, Jordan, Cambodia, Cayman islands, Liechtenstein, Sri lanka, Luxembourg, Monaco, Macao, Martinique, Maldives, Nicaragua, Oman, Pakistan, Paraguay, Reunion, Uruguay.